Get a step-by-step guide to installing the openFrameworks platform on Microsoft Visual Studio. This tutorial will cover how to set up the openFrameworks toolkit on a Windows-based computer and how to use Microsoft Visual Studio to run example projects of the program's functions. We'll also be learning to install a specific plugin that enables openFrameworks projects to open in the Visual Studio platform. openFrameworks is an open source, C++ toolkit designed to assist the creative process by providing a simple and intuitive framework for experimentation. It can be compared to the processing development environment, but it offers additional features. It enables the user to create interesting UI elements, communicate with an Arduino and also handle the backend computing required. This platform is designed to work like all-purpose glue; it wraps together several commonly-used libraries. If using a Mac or Linux product for this tutorial, you can find a step-by-step installation guide for both Mac and Linux users on the openFrameworks website. To download openFrameworks, start by going to the platform's download page. Then, select the 'visual studio (2017)' download link under the Windows column. Image with the circled location of the 'visual studio (2017)' download link. After downloading the file, unzip it and place it anywhere you'd like. In order to write and edit projects for openFrameworks, we'll download and install Microsoft Visual Studio using the program installer file in default settings. Note: For QuickTime or MP4 video file support, you'll also need to install the video codecs. The K-Lite Codec Pack is recommended; it's free and provides comprehensive support for a wide range of video formats. To avoid an error message when attempting to use openFrameworks with Microsoft Visual Studio, install the 'Common Tools' set for Visual C++ 2017. To install, navigate to 'File', 'New', then the 'Project' section in the Visual Studio software and choose the Visual C++ template. From there, you'll see the option to install 'Common Tools' file, select it and follow the instructions that appear. 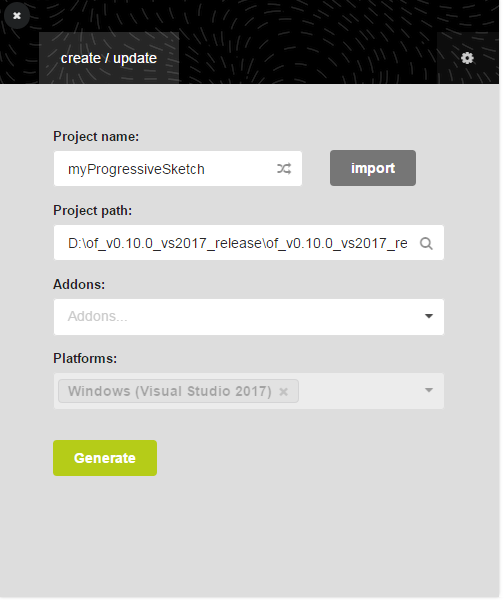 The project generator function is used to create and run projects for the openFrameworks platform. You can use it through the major operating systems (specifically, macOS, Windows, and Linux). To use the function, find the 'your-openframeworks_directory' folder then the 'projectgenerator' file and run it. Image of the project generator window. It's recommended to set the project path within the openFrameworks folder to the 'apps' subfolder. For example, if you created a project called 'simpleSketch' and inserted it under apps or myApps. It would make the full path for the openFrameworks root file to apps/MyApps/simpleSketch. You can use this tip as a helpful organizational strategy if you happen to be working on different projects. Lastly, don't forget to adjust the settings, depending on the location of the openFrameworks file in the hard drive. To relocate or move a file, you can update the project generator to change the folder depth of where a specific file is stored. At this point in the tutorial, we've set up Microsoft Visual Studio and the openFrameworks platform. It's now time to attempt to run the examples of openFrameworks functions. 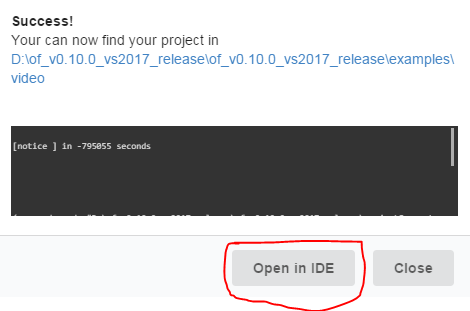 You'll start by opening the project generator function and clicking on the 'import' button. 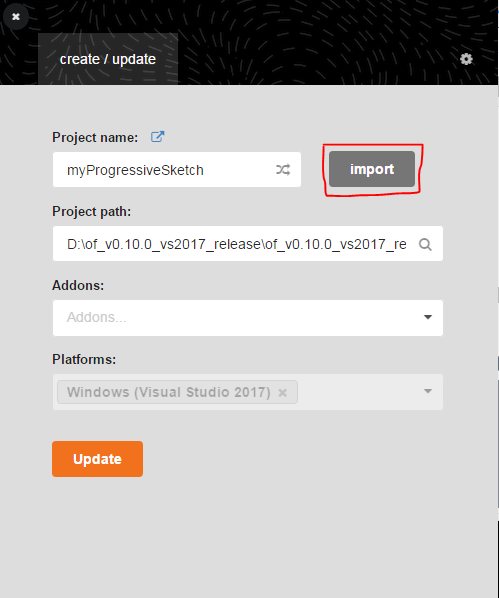 Image of project generator window with 'import' button outlined. Next, go to your '_openframeworks_directory' file, select the examples then video subcategories to reach the 'videoGrabberExample' folder. 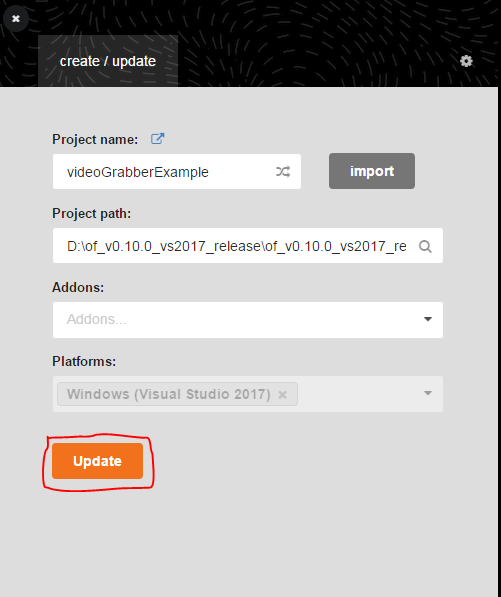 Image of project generator window with update button highlighted. After selecting the update button, a window will pop up with the option to open the project in Microsoft Visual Studio, go ahead and do so. The last step is to click on the run button for the program to build the project. An output window will display the example project result as demonstrated in the image below. Image of Microsoft Visual Studio output window displaying a project result. Featured image courtesy of Microsoft Visual Studio.